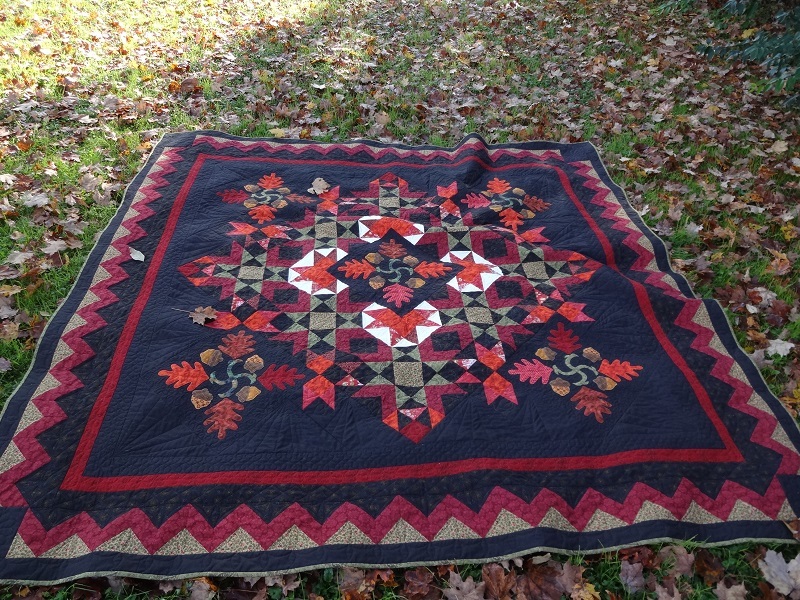 Amity Quilter: Autumn Oaks is Finished! So happy to have this one in the finished pile, sans label but I'll get to that this week. Warning photo-heavy post coming up! There was one morning last week that dawned bright and clear, and COLD, with early morning temps in the low 20s. But if I was going to get any outside photos that was the morning! So, shall we venture out the back door? Please say yes! Standing in for our lack of colorful foliage this fall, due to all the rain I suppose. We were fortunate enough to find beautiful huge mums at our local supermarket for only $5. Pumpkins were from our garden, and the little sugar pumpkins were all from one volunteer plant that showed up among the green beans. Yay for homemade pumpkin pies (and quilt holder-uppers)! By the time I got outside the temperature had risen to a balmy 35 degrees and the frost had mostly left the lawn. Back inside at one of my usual spots for photographing quilts. I like the outside shots better this time. 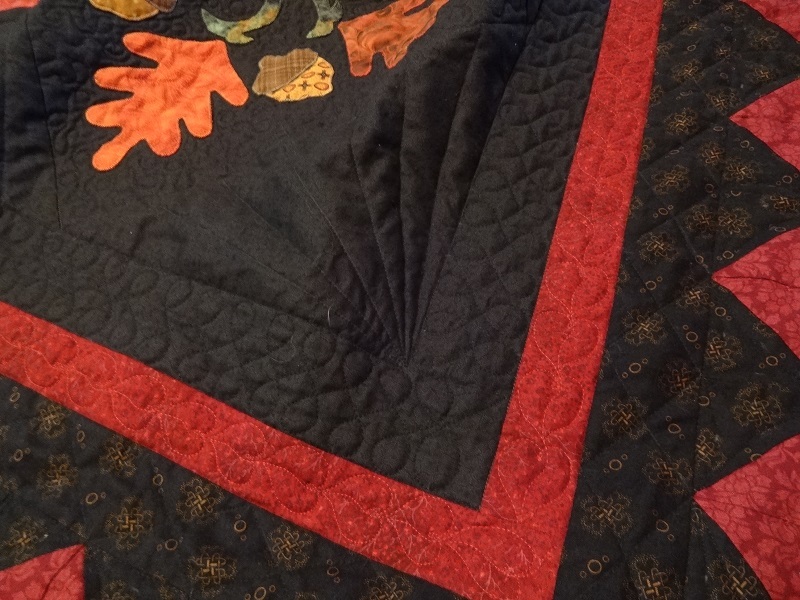 A closer look at some of the quilting. You might be able to see the quilting better in this next photo of the back. This quilt finished at about 90x90 inches, and the pattern can be found in the Fall 2010 issue of Quilt Sampler. So now it's on to wash and fluff, and set aside in the blanket chest awaiting a special day in the (hopefully near) future as this one is slated to be a wedding gift. 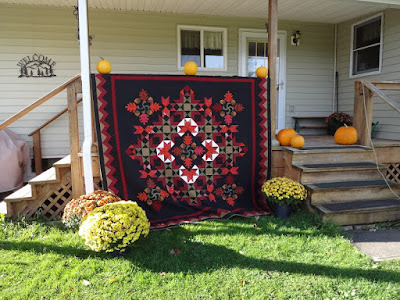 It had been nagging on me since beginning the applique and piecing over three years ago, wanting to be finished before I get too old to be working on quilts this big! 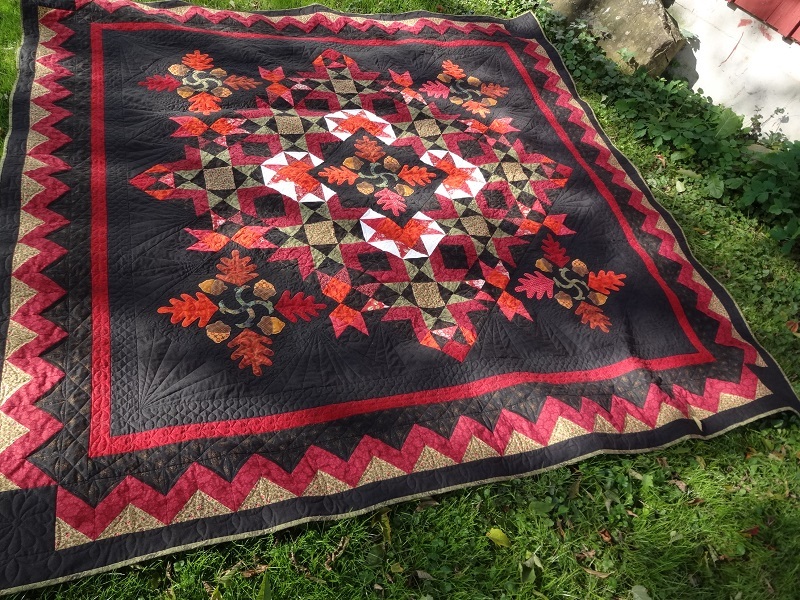 Have I mentioned recently that there are two king and one queen size waiting in the wings - all hand quilted? We had our second snow last night, only a trace here in our valley, but several inches just a couple hundred feet up the hillsides. Two quilts on the bed now, with a third folded and waiting in the wings for those really cold nights coming all too soon! That quilt is totally amazing---design and quilting!!! Yes, this year was a fab year for mums (although your $5 deal beat any pricing around here!!). Thanks for sharing! Gorgeous! Love the outside photos with the pumpkins and in the tree! Just perfect setting for this beauty. 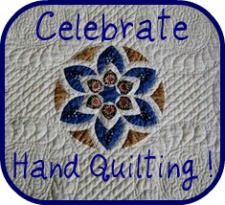 You did a great job with all the quilting. It is absolutely ready for gifting. We had a two quilt night last night! Our first and probably last down here...lol. Completely divine!! Your border is so pretty! Wow, it’s just gorgeous, Pat. Beautiful work. It was fun to see all those pictures, especially since I’ve been there! 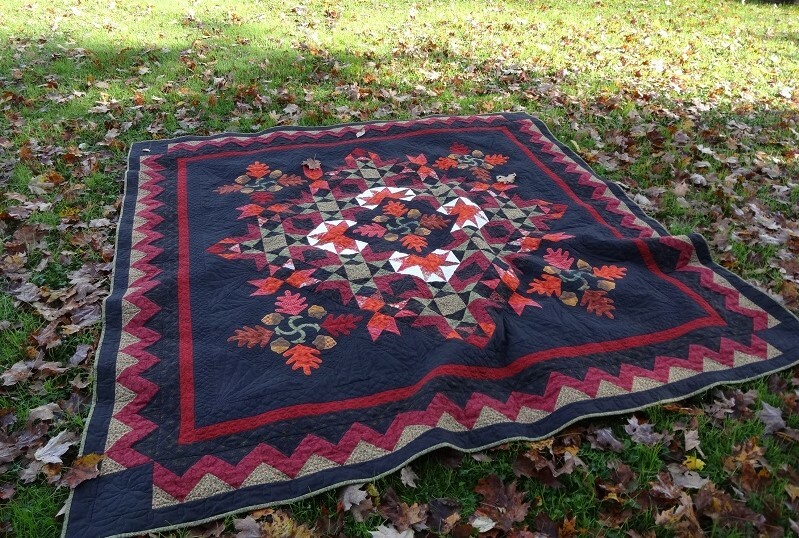 There's so much to love about this quilt. The colors, the design, the fine workmanship... Wow! Congratulations to the lucky recipient of the beautiful quilt! Thank you so much! You are a 'no reply' blogger or I would have responded personally. Thanks for visiting! Oh, that's beautiful. It absolutely glows. The quilting is superb. It will make a wonderful wedding gift. Two quilts on the bed here now too. I harvested pumpkins and squash last month and have made pumpkin pie a couple of times. Yumm. I've never had volunteer pumpkins but I'd sure welcome them. 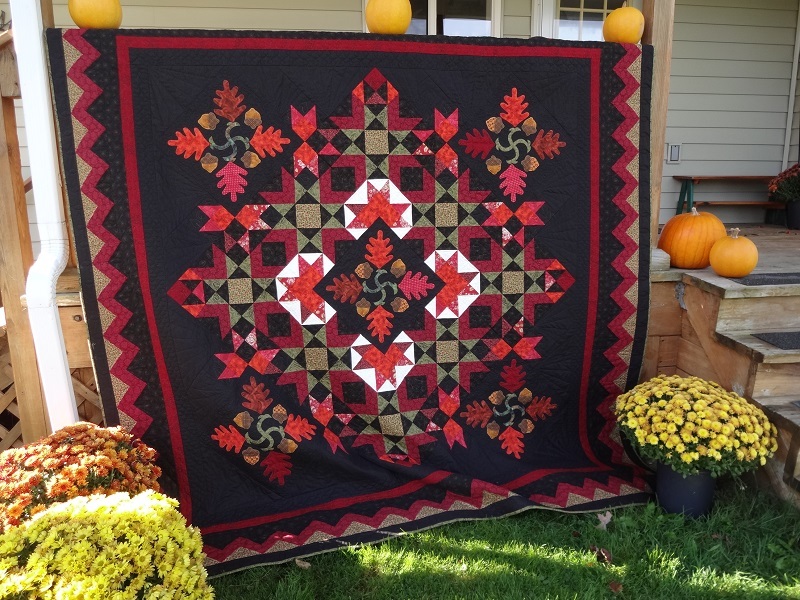 Such a wonderful quilt, absolutely lovely! This is a wonderful wedding quilt. 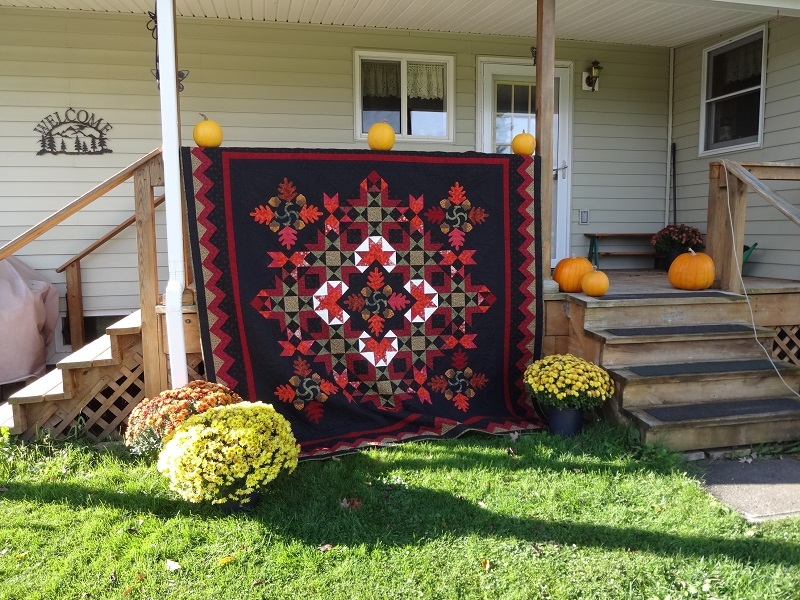 What a beautiful, beautiful quilt! 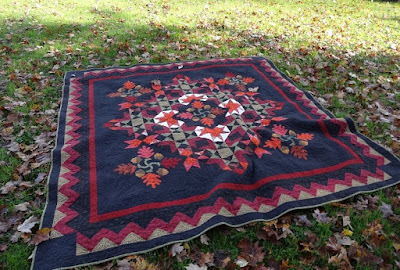 I love the colors you used and the oak leaves are just perfect. This is definitely destined to become an heirloom (if it doesn't get worn out for love of it first). I love your big back porch with the steps going down two sides. 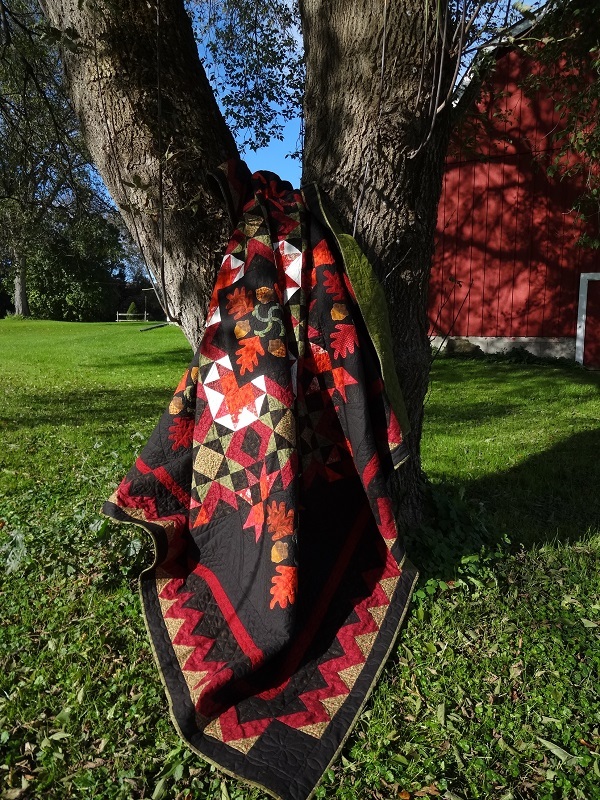 It looks like it could be a comfortable place to sit and quilt (when the weather is warmer, of course). You're ready for fall. Love the photo shoot along with the mums and pumpkins. 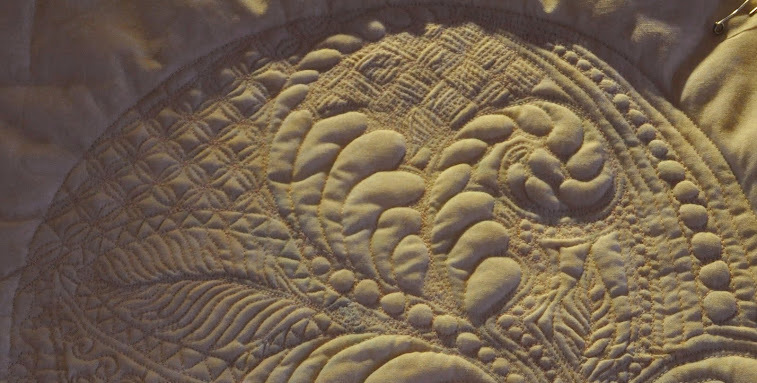 The quilt is beautiful. It's a heirloom, for sure and will be a wonderful wedding gift. That is really gorgeous. 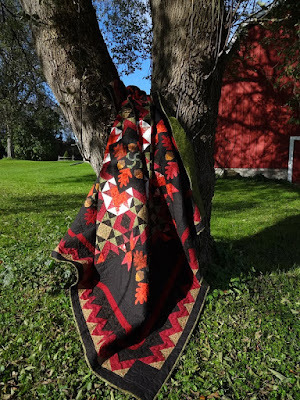 I especially like the photo of the quilt on the tree. You are brave to venture out in those temps for a photo. 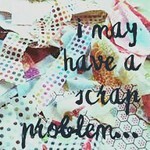 Some of my best quilty friends are those I met through comments left here. Words of encouragement and advice are music to my ears and always appreciated. If you are a no-reply blogger and have a question, please include your email address and I will reply to the email address provided. Thanks!. My Babcia (grandma) was a very special person in my life. 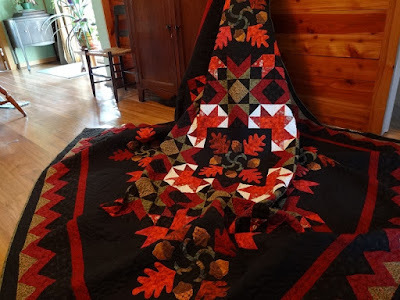 Although she was not a quilter, she sewed beautifully on her Singer treadle machine, fashioning dresses and other items for her two girls during the Depression years. One of my earliest memories is of my mom sewing at that treadle machine in Babcia's big country kitchen and of being allowed to treadle the machine when she was finished. Now I collect vintage Singer machines and use them to make quilts for my own grandbabies. 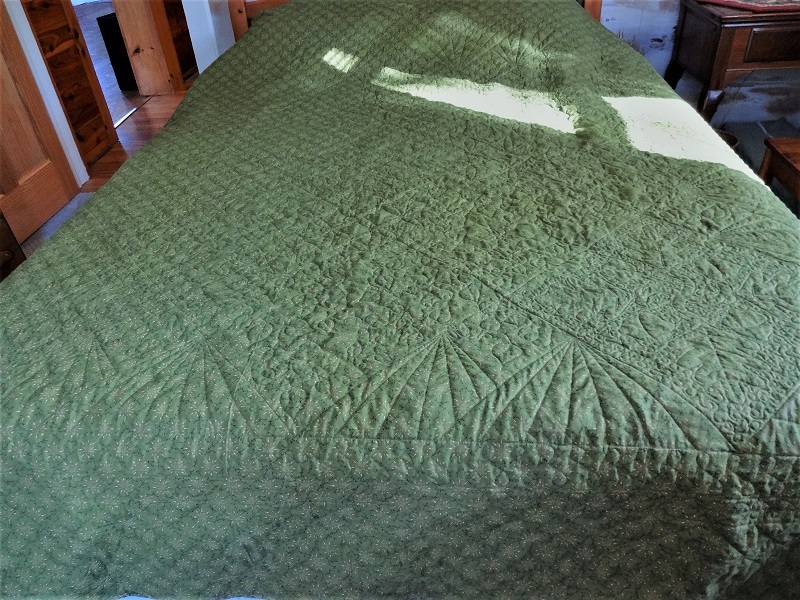 And so now I am a quilting Babcia.